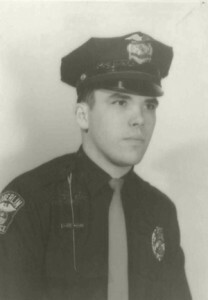 Patrolman Robert B. Woodall was killed on March 10, 1971 when his patrol car slid on an icy road and struck a tree at 45089 East Hamilton Street while he was patrolling near Oberlin Reservoir. Patrolman Woodall was working the midnight shift and was last seen at approximately 4:30 a.m. Fellow officers became concerned when he failed to respond to radio calls. They began a search for his location. At 6:23 a.m., officers located Patrolman Woodall's cruiser, which had left the icy roadway on East Hamilton Street near Parsons road and sustained heavy damage after striking a tree. He was located, deceased, inside the vehicle. A three-year veteran of the department, Patrolman Woodall was survived by his wife, father, sister, and grandmother. NEVER FORGET! On behalf of the Westerville, Ohio Division of Police, we honor the dedicated service and ultimate sacrifice of Patrolman Robert B. Woodall of the Oberlin Police Department, Ohio and the additional 65 American Peace Officers who have paid the ultimate sacrifice on this date in history.